Lightmaps back ,Global illumination,Image based shaders ? Shadmar, can you post a test with and without the shadows? YouGroove got a point that the scene is really too simplistic to really see the difference. Shadow calculations in a scene like that would be really fast. Perhaps adding some walls? I'm about sure, that if rendering optimization were made there in shadow rendering first, we could gain more FPS than in other areas. 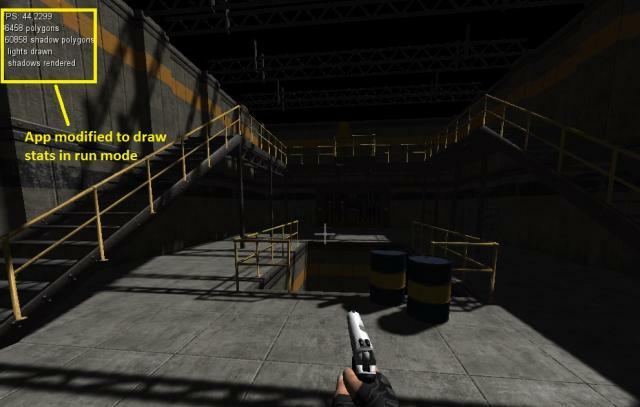 With proper lightmapping, on a "static" scene, shadowing could be faked, and we would get high FPS and simulate high quality. Putting shadowing everywhere at the moment I think, kill the performance. I see that Josh give the option on the editor to decide to calculate shadows with models. And from what I see so far, I would only try to cast shadows from moving models everything else would be "baked" in the scene. From what I've learned so far, it's not alway the tools that give good results but on how we use them. And in this area, it a game of illusions. (I take for example "God of war" that achieved incredible results on the PS3). Trying to get "realtime" rendering that would match this is unrealistic with a single or small team in my opinion. Oh com'on shadmar ... i could show you TressFX demo scene with great FPS and very poor frame rate when used in a real game situation. What we have a blue cube and lights, this is far from representing performance in real game situation. Actually, the renderer is pretty indifferent. It only performs lighting on the final screen pixels, so it doesn't actually care how much geometry is onscreen. Your screenshot of the castle above is pretty optimal because it's just a single directional light pass. The underlying geometry does not matter, whether it is a complex scene or a simple one, it;s just the same number of pixels. I would expect that scene to run much faster than in a situation like Shadmar posted, where you have lots of overlapping lights rendered in many passes. I made a cubic small level made of walls and floors, some cylinders (so several model entities), with some 3 different diff/normal/spec shader materials , even with one directionnal light only, the frame rate was around 38-50FPS. I'll post a simple level. At final perhaps this is not so bad considering that this is not an army of engineers making the engine, so that's perhaps this to us to target a different audience with LE3 and forget mid/old PC having OpenGL4 but not enought powerfull to run LE3 FPS demo smoothly. - one directionnal light only (anti alias*2, medium light quality) : 40-50 FPS. Map provided for anyone interested. So in case of multiple lights , LE3 will need a good PC to be at ease not only OpenGL4. How to increase frame rate in that case ? About 250 on your level. Do you realize what a miracle it is that Leadwerks is running a deferred renderer on integrated graphics at 40 FPS? Two years ago the idea of Intel graphics even running was a fantasy. 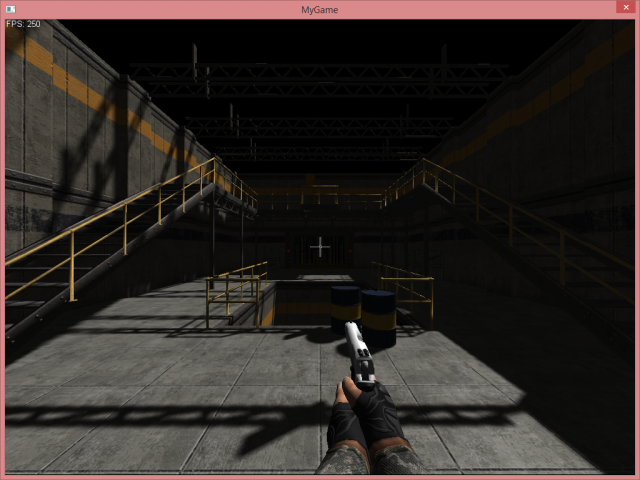 Your laptop does not have graphics card, yet it is rendering fully dynamic lighting. The situation today is extremely good. The difference in the framerate is due to the hardware disparity. The situation today is extremely good. This is a good point of view indeed. LE3 requiring minimum OpenGL4 is some restrictive point and some of us are perhaps targetting too much larger PC range. For example , personnaly , i would had liked any OpenGL4 PC (old, medium, new but all OpenGL4) to be at least always 60 FPS with FPS demo even on basic Intel PC, perhaps i ask too much ? - LE3 lights and shadows are actually in FPS demo just rendered at any time without any software optimisation, with good PC it won't be too noticeable perhaps, but this is obvious in medium/basic ones. Somewhere this is wasting GPU, that could be gained. Why i say that, only because there is lot of software solutions to really improve frame rate, pure hardware rendering is not the way , if big studios adopt Umbra and other software LOD systems, there is a reason i think, or i could not run AC 4 , Witcher 2 on my Intel motherboard video chip. Indeed people can create their own performance software layer on Lua or better in C++, that's just i had prefered to have it in LE3 directly. It's probably a blessing and a curse because sure it can actually run the application, but it seems these intel laptop cards are still much less powerful which means just saying you need something that supports OpenGL 4 doesn't seem very accurate as the performance can still be bad. I use a laptop, but it has a Nvidia GTX 770M card, so it's dedicated. Yeah, I agree. While a card my technically support OpenGL 4, that doesn't mean that you could run it above 30 fps with any level of notable performance. The good news is I believe there is plenty of room to increase the performance of LE3.1. I'm not sure if Josh uses a professional profiler or not, but it may be worth it. YouGroove's test scene: I get 88 FPS (release) with Intel 4000 and 111 FPS with dedicated GT 630M. 2 year old Toshiba laptop. With last update running original LE3.1 FPS demo , i got on PC now 125 average FPS and some 80 slowdown at some moment when two crawler appears, but jump up again to 125 average FPS. With Vsync on medium quality and Anti alias * 2 , i got constant 60 FPS. Has it been some LE3.1 changes ? Ok i runned some game really good also, and i remembered i switched on my PC from Intel integrated GPU chip to Radeon graphic card, so the boost is normal (and FPS could be expected to be better). Actual lightening in LE3 is standard hardware lights and shadows, nothing new, LE3 will need some day physic shaders as they are becoming the new standard, specially when thye can be find as free open source system. Same for global illumination/image based lightening. These new graphic features are real "next gen" graphics and allow really better realistic graphics, specially physically based shaders, this is the way for indie teams going towards advanced graphics. BRDFs is the non-marketing term, and they are a very old technique. Old perhaps, but allow lot of visual advanced stuff as metal and roughtness, simple specular shader can't do, and lot more. This is what people are going to use today, specially with new tools like Substance or others allowing to create such advanced textures for metal ,roughness, reflection . Unreal has shaders extended from very long time as their shader editor allowed you to make custom kind of metal/specular shader different and more advanced than simple specular. LE3 uses standard even lot more old shaders as this is basic specular/normal map, it don't have metal, roughness , real relflective shaders that are becoming the new standard. I just hope that will come in LE3 caus it makes a real difference in visual quality, like advanced lightening is looking very different from Basic lights and shadows.